The tornadoes that struck Verona and southwest Madison earlier this week were a good reminder: if you don’t already have a weather radio, get one. I am admittedly a bit of a weather nerd, but I think everyone should have a weather radio alarm. Come for the bone-jarringly loud alarm that will launch you out of your bed in a tornado warning! Stay for the weather nerd joy of seeing the first Winter Storm Warning of the season light up the weather warning light. Right? With Monday night’s storms, our weather radio alarm gave a few minutes more warning than the outdoor tornado sirens, which, at our house, were muffled by closed windows and air conditioning. The National Weather Service (NWS) tornado warning provided a 17-minute heads-up to those in the path of the tornado that hit Verona (an EF3! ), For the EF2 tornado near Schroeder Lane, however, the warning was issued at the same time the tornado touched down – 12:20 a.m. It was a bit of a surprise and a scramble to rush back down to the basement for a second time; we thought we had the all-clear after the first warning expired minutes earlier at 12:15. But, the weather radio still gave us a few minutes warning of a tornado that had just touched down 2.5 miles southwest of our house. It seems a bit incongruous, but for me, the key feature when shopping for a weather radio was ability to disable alerts. I want the alarm to go off for a tornado warning. I don’t need or want it to wake up my whole house for a blizzard warning. Another critical feature to look for is Specific Area Message Encoding (SAME) compatibility. 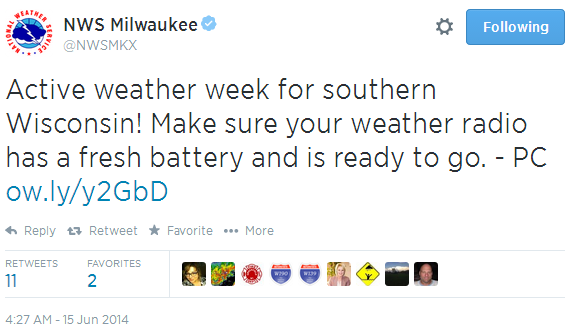 SAME allows you to set your weather radio to receive alerts for a specific county. This is now a fairly standard feature with weather radio alarms, but still one you want to be sure you have. With older weather radios that don’t support SAME, your weather radio alarm will sound for every warning issued anywhere in the local forecast office’s watch area, which usually leads to the alarm getting unplugged and forgotten. The last must-have feature is battery-backup — a weather radio without battery backup won’t be much help if your power goes out. 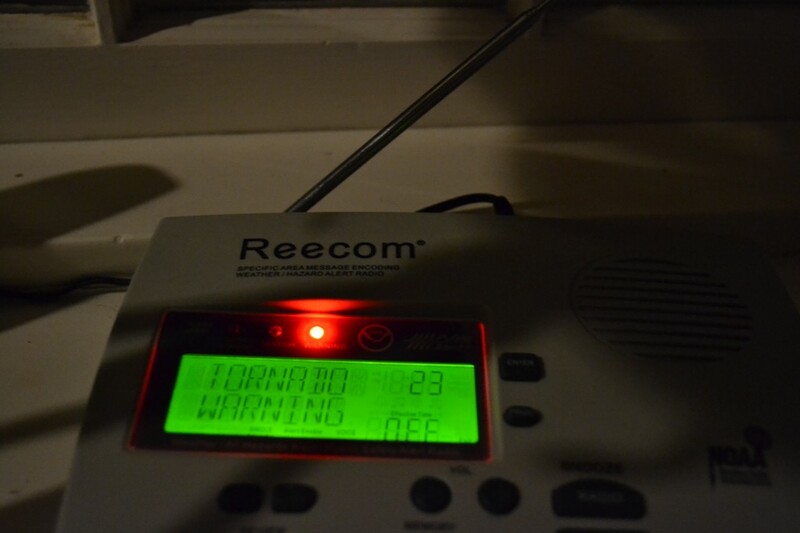 My weather radio is from Reecom. The current model is the Reecom R-1630C and it has all the must-have features I’ve mentioned above. The radio was also fairly simple to set up and use, reception of our local weather radio station is good, and it’s still working after a few years of use. One last feature I like about this radio: you can adjust the volume level for the alarm (even at the lowest setting, it’s still really loud). You can buy one for $46.50 shipped from Amazon. Midland brand weather radios offer similar functionality. I haven’t used one myself, but co-workers who have them have been happy with them. Just be careful which one you buy. Unable to recommend: The Midland WR120 is sold locally in store at Radio Shack and Walgreens stores for $40, but after reading at this radio’s manual and online reviews, it appears the WR120 may lack the ability to disable certain alert types. For $3 more, you can buy a Midland WR300, which adds an AM/FM radio and the capability to select which weather warnings will sound the alarm. The WR300 is available online for $43 from B&H or Amazon. Once you have your weather radio, make sure you put it somewhere it can pick up the local weather radio station. We put our weather radio in front of a window to make sure we were receiving a strong signal. Test the reception by listening to the weather radio — if there’s a lot of static and it’s difficult to hear your local station, your radio may miss alerts due to poor reception. Once you’ve confirmed that you can hear your local weather radio station loud and clear, you should also check the weather radio’s log of received messages to make sure it’s receiving the weekly test (here in Madison, that’s Wednesdays at noon). This is most important after setting up the radio for the first time — checking for the weekly test in the log will let you know you entered the SAME code correctly. If you enter the wrong SAME county code when setting up your radio, you won’t receive alerts for your county. The Wireless Emergency Alerts (WEA) feature available on many new smartphones is fantastic — it provides the same emergency alerts that a weather radio alarm would, but unlike your weather radio, you take your smartphone everywhere. If you’re on the move, WEA will even provide alerts if you drive into an area that is covered by a pre-existing warning. So, if you already have this on your smartphone, you may be wondering “why should I buy a weather radio?” For me, it came down to two reasons: first, if there are widespread power outages, cell phone service may not be available (see NYC after Sandy). And second, I don’t sleep next to my cell phone. I’m not sure I’d hear it (even with the loud WEA alarm) from where it’s charging downstairs. If you’re on social media, following your local NWS office on Facebook or Twitter is a great way to find out about longer-term severe weather risks. This week, for example, the Milwaukee forecast office posted to social media Sunday morning about the severe weather threat in southern Wisconsin for Monday and the rest of the week. Outside of Madison/Milwaukee, if you’re unsure which NWS forecast office is yours, visit weather.gov, enter your ZIP code, and look for the link to your local forecast office. For more information about this week’s storms, NOAA weather radio here in South Central Wisconsin, or about NOAA weather radio in general, see the links below. This entry was posted in technology reviews, weather on June 19, 2014 by john.